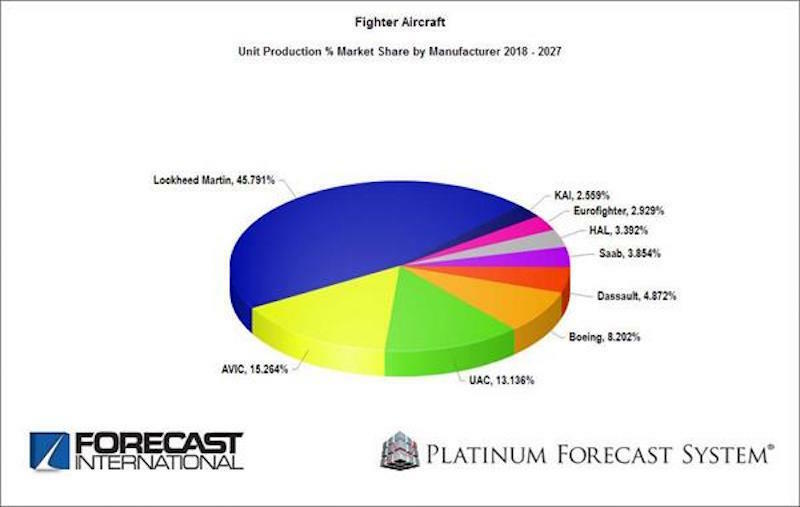 NEWTOWN, Conn. --- In its new study "The Market for Fighter Aircraft," Forecast International projects that a total of 3,243 fighter aircraft will be produced from 2018 through 2027. The value of this production is estimated at $249.3 billion (in FY18 U.S. dollars). The total number of fighters to be produced over the next decade is 13.1 percent (377 units) higher than the number of aircraft produced during the previous 10 years, when production in the fighter market averaged about 280 aircraft per year. Production during the 2018-2027 forecast period will peak at 380 aircraft in 2021. Annual production will then decline through 2027, with production falling to 269 aircraft that year. The Lockheed Martin F-35 will be the largest fighter program over the next decade, due primarily to its selection as the tactical fighter of choice for the U.S. Air Force, Navy, and Marine Corps. Indeed, of the 3,243 fighters expected to roll off the production lines during the next 10 years, 1,466 will be F-35s, representing more than 45 percent of the market. The F-35 program has also secured several export customers, but Lockheed Martin must continue to reduce the aircraft's procurement and operating costs if it is to achieve sales expectations on the world market. The outlook for the remaining U.S. fighters – the Boeing F-15 and F/A-18E/F Super Hornet and Lockheed Martin's own F-16 – was once grim but has improved in recent years. While many of the U.S. government's allies – traditionally the best customers for U.S. fighters – will likely buy the F-35, uncertainty over the aircraft's capabilities and the high cost of early production aircraft are leading other countries to consider legacy U.S. aircraft. "One key market for legacy aircraft from the U.S. and Europe is the Middle East," said Forecast International Senior Aerospace Analyst Douglas Royce. "Orders from energy-rich customers in the region are helping to extend production lines at Boeing, Lockheed Martin, Dassault and the Eurofighter consortium." European manufacturers will account for 11.6 percent of fighter production during the forecast period. This includes the Eurofighter Typhoon (95 units), Dassault Rafale (158) and Saab Gripen (125). Meanwhile, Russia's United Aircraft Corporation (UAC) will continue to provide fighters to nations outside the U.S. and European defense spheres. China is a potential competitor in this submarket, but has yet to fully develop a solid export program for its most advanced fighters. Forecast International, Inc. is a leading provider of Market Intelligence and Consulting in the areas of aerospace, defense, power systems and military electronics. Based in Newtown, Conn., USA, the company specializes in long-range industry forecasts and market assessments used by strategic planners, marketing professionals, military organizations and governments worldwide. Forecast International also maintains a high posture of situational awareness and geopolitical analysis.